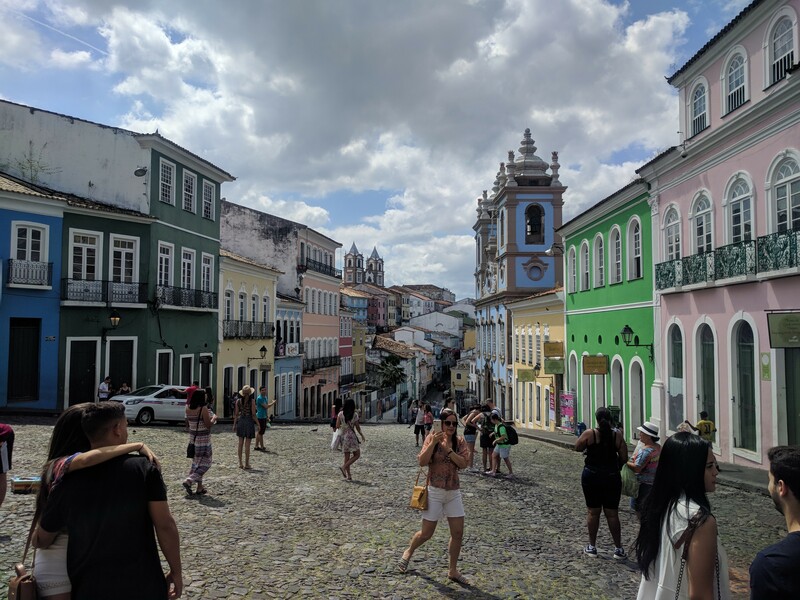 In this update, we reach our final location outside of the US: Salvador, Bahia. My time here was a real mixed-bag of experiences, leaving me with feelings of accomplishment as well as regret. When we left off last time, our ferry had just docked in Salvador, our final song place in South America. 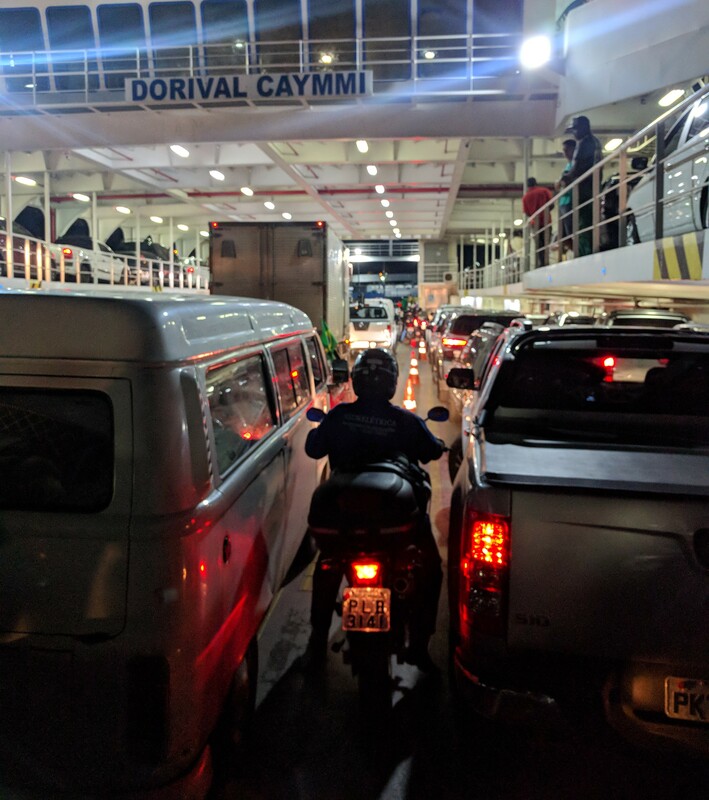 The ferry was unloaded according to Latin America rules: If you sort of fit, you go. 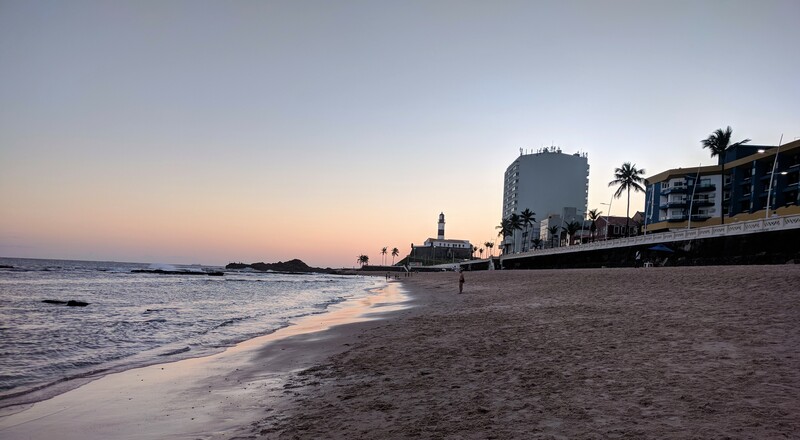 When telling Brazilians that I was heading to Salvador, they invariably had one of two reactions: “That city is beautiful” or “That city is dangerous.” As I was arriving after sunset, I was on high alert as I made my way to my hostel. The ride ended up being very scenic and I didn’t feel uncomfortable at all. My home during my stay would be To Em Casa Hostel, at $14/night. 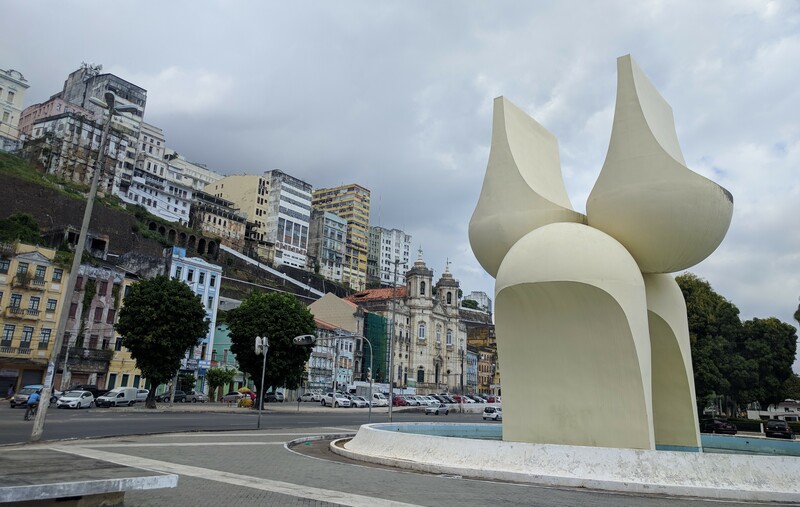 It is located in the Barra neighborhood which lies at the Southern tip of Salvador. This neighborhood is absolutely beautiful and absolutely safe. 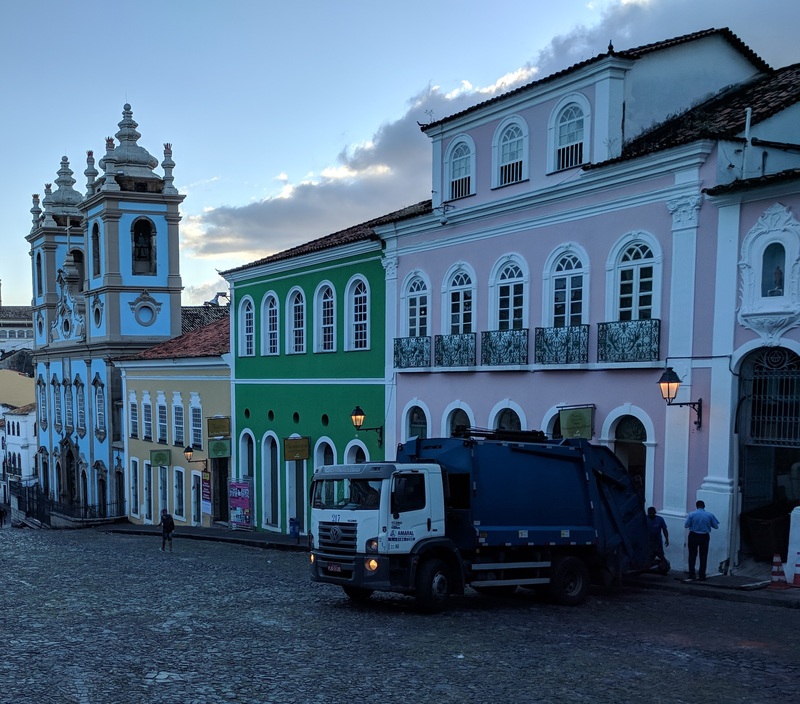 My first day in Salvador was a bust, as I was having some stomach issues again. This has been the greatest detractor to my otherwise wonderful stay in Brazil. Thankfully, I wan’t too miserable to get some work done and I made decent progress on the day. 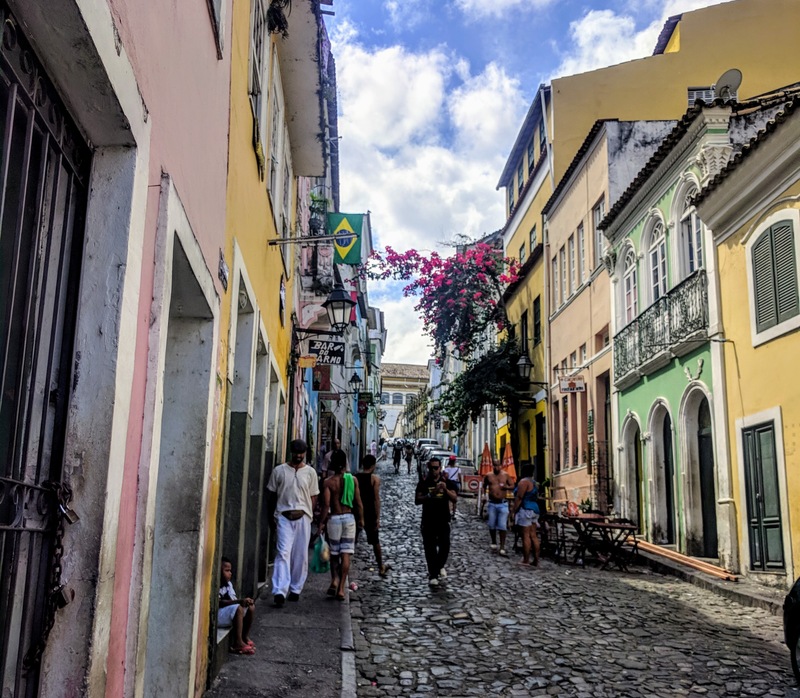 I decided to walk down to the old city center in the neighborhood called Pelourinho. It was a long walk which took me through a wide variety of neighborhoods. 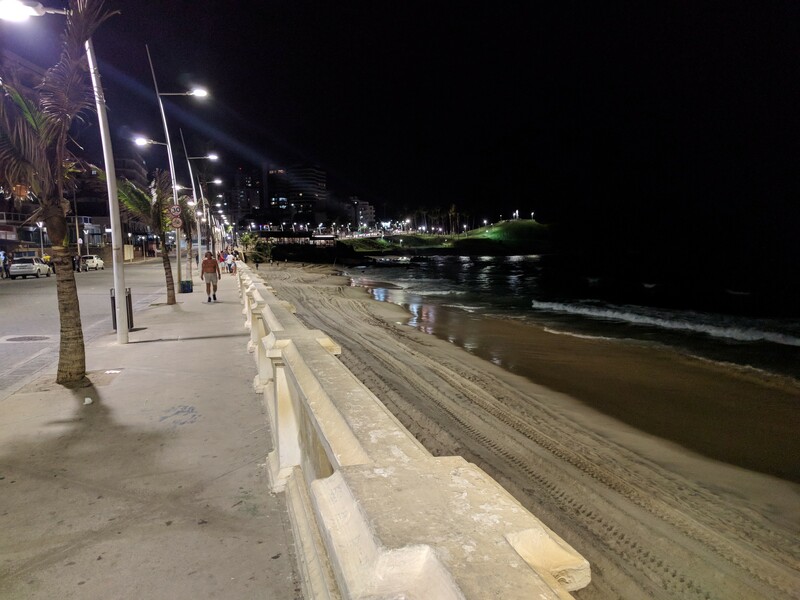 As it was Sunday, Brazilians were packed onto the beaches. 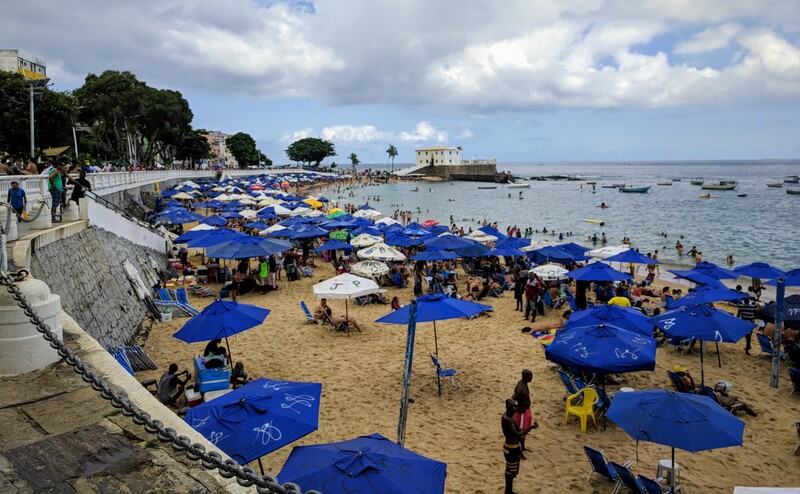 The beaches of Salvador are said to be some of the best in the world. As a Nebraskan, I’m thoroughly unfit to offer my opinion on this matter. They had some sand and some water so they seem pretty nice I guess. Vendors were selling were selling every sort of food and aquatic accessory imaginable. Cold beer was about 40 cents and frozen coconuts were about 75 cents. I’ve gotta be honest, I wasn’t familiar with this city before I started researching for my trip. But given it’s size, I’m surprised I’d never heard of it. 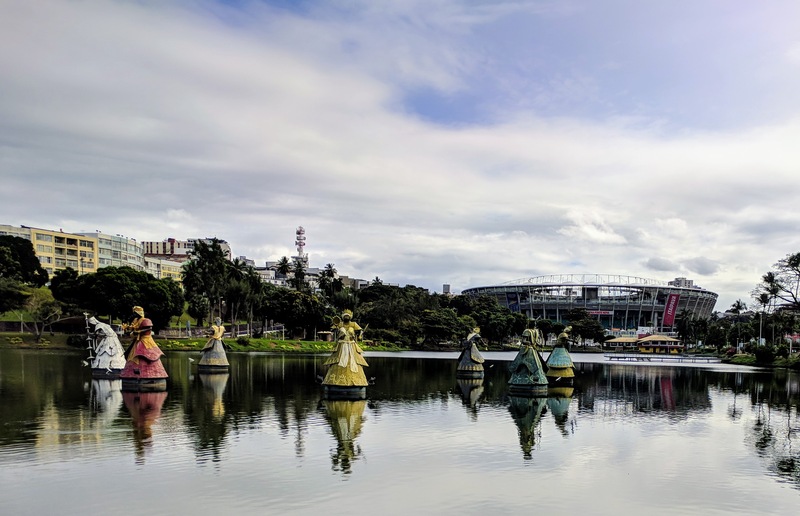 It is home to nearly 3 million inhabitants, making it the 11th biggest city throughout all of the Americas. It is actually the biggest city mentioned in my song, just outranking Chicago and Toronto. 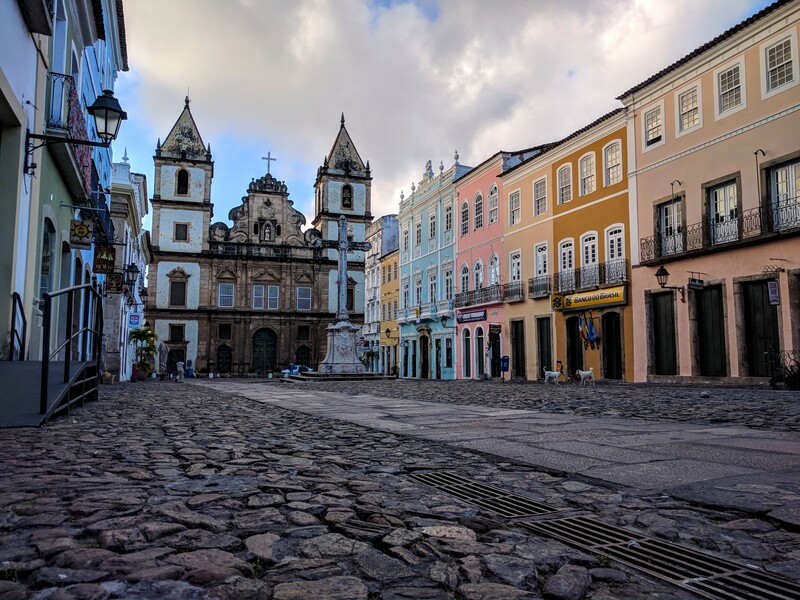 Salvador is one of the oldest cities in the New World, being founded in 1549. It has a strong African influence, due to the fact that it was the first slave port in the Americas. My first impressions of the historic center included some disappointment. 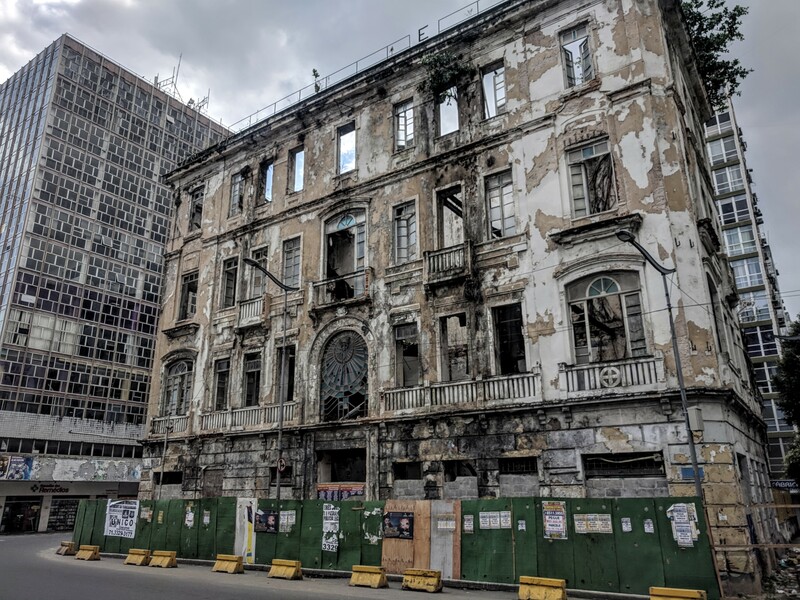 There was some great architecture, but a lot of it was really run-down. 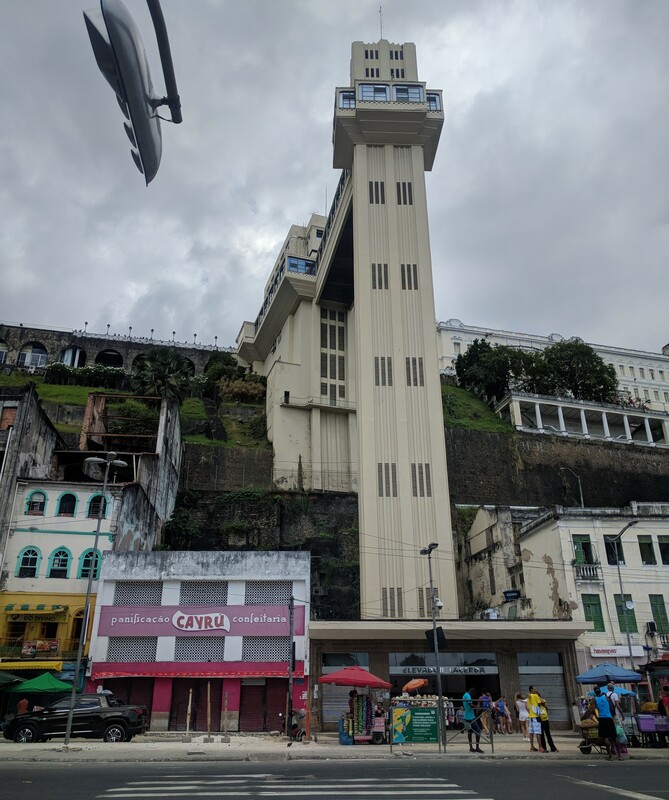 I spent some time in the old market area before taking the elevator up to Pelourinho. The historic part of the city was picturesque, but really hectic. There were so many vendors who were really pushy. 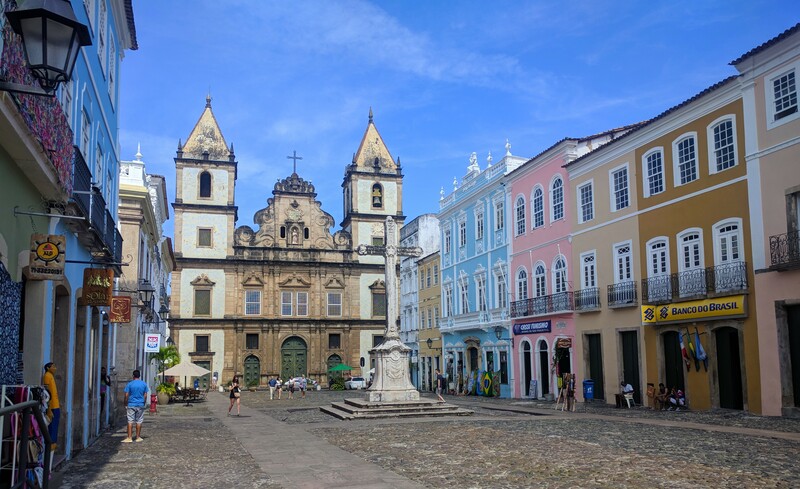 The main square, pictured below, is where I knew I wanted to take my quintessential Salvador picture. Michael Jackson filmed the video for his song “They Don’t Really Care About Us” in this square. 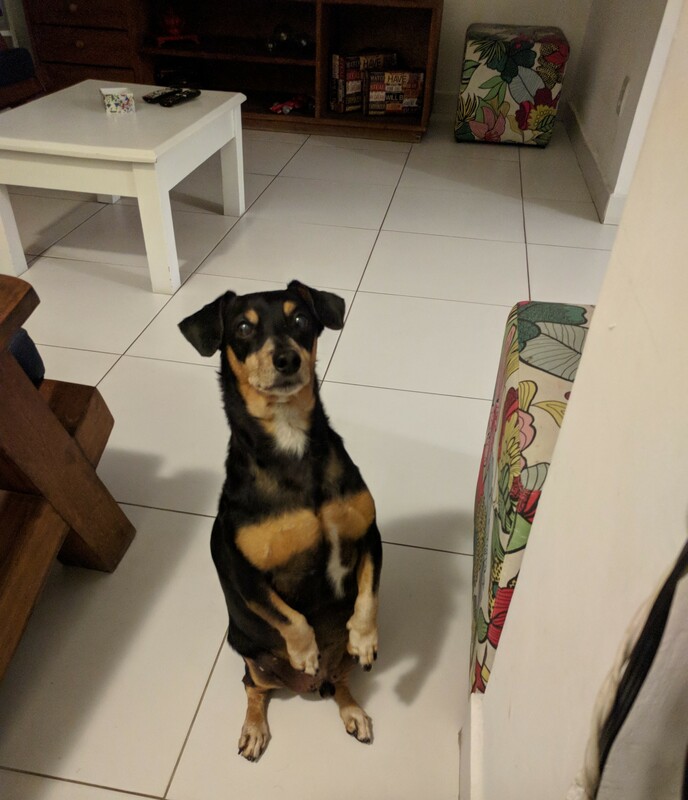 I wasn’t sure if I’d be able to get Annie in here. Firstly, the street is only open to commercial traffic. Secondly, there are almost always crowds of people around. I thought I would try sunrise the next morning. 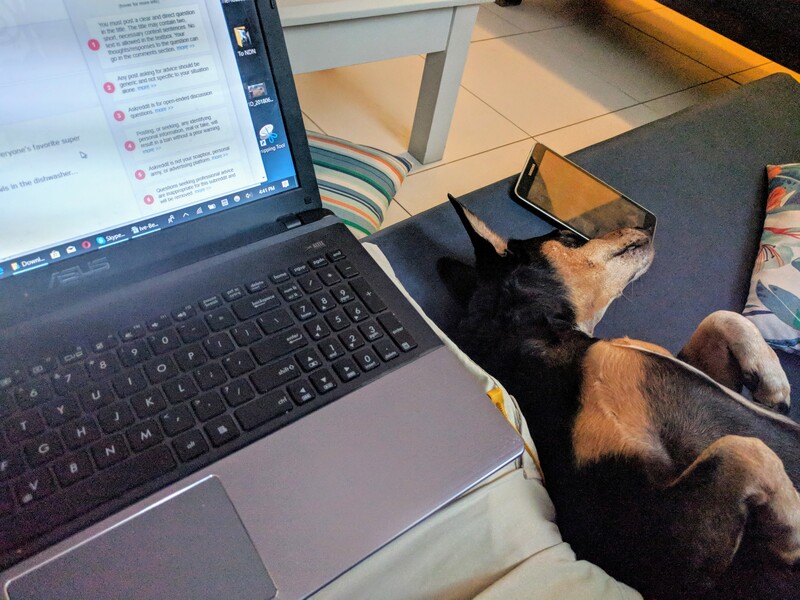 I spent most of the rest of the day in the hostel doing some writing, though the house dog did his best to distract me. When I get up before sunrise, it usually means I’m on the hunt for a good photo. 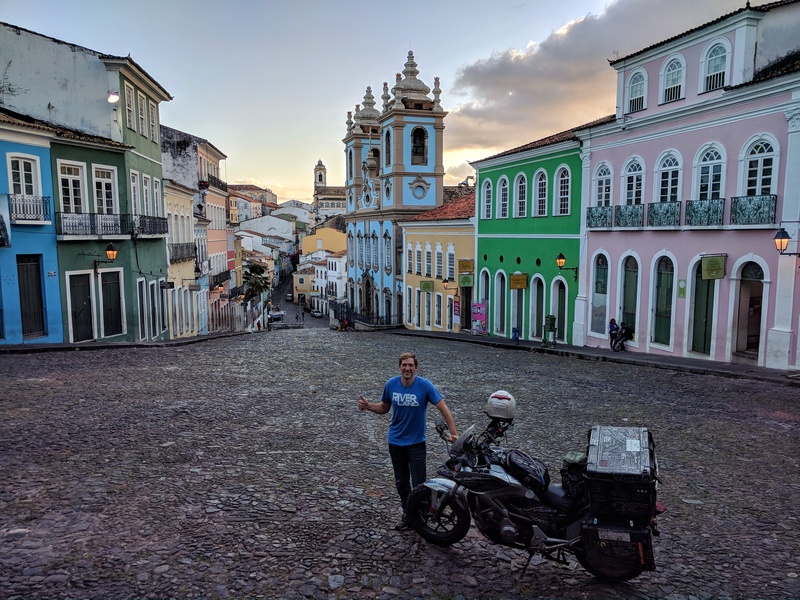 I saddled up and arrived in Pelourinho just as the sky started to lighten. 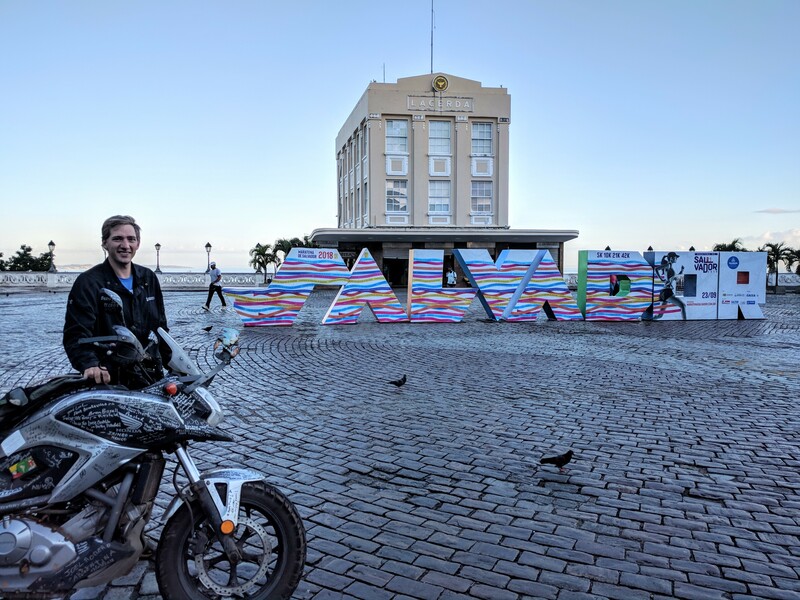 At the top of the elevator was the Salvador sign, so I made that my first stop. 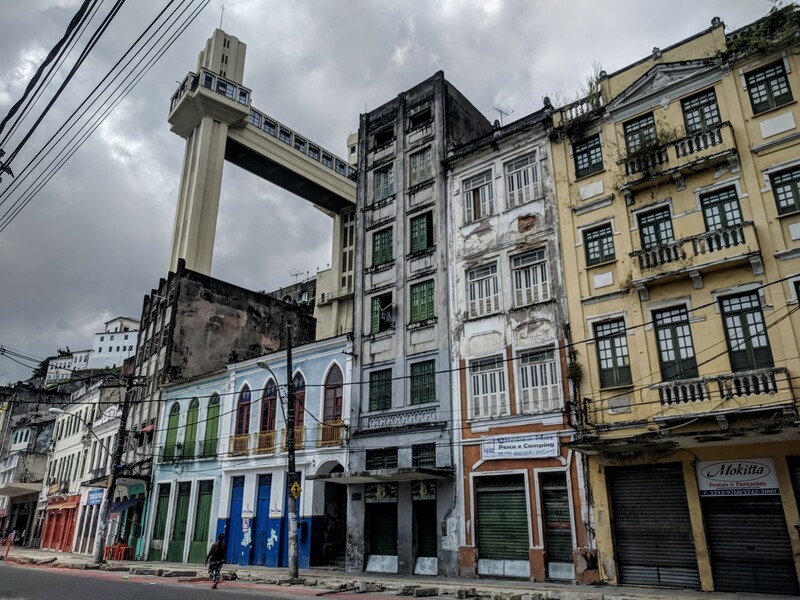 On to Pelourinho. 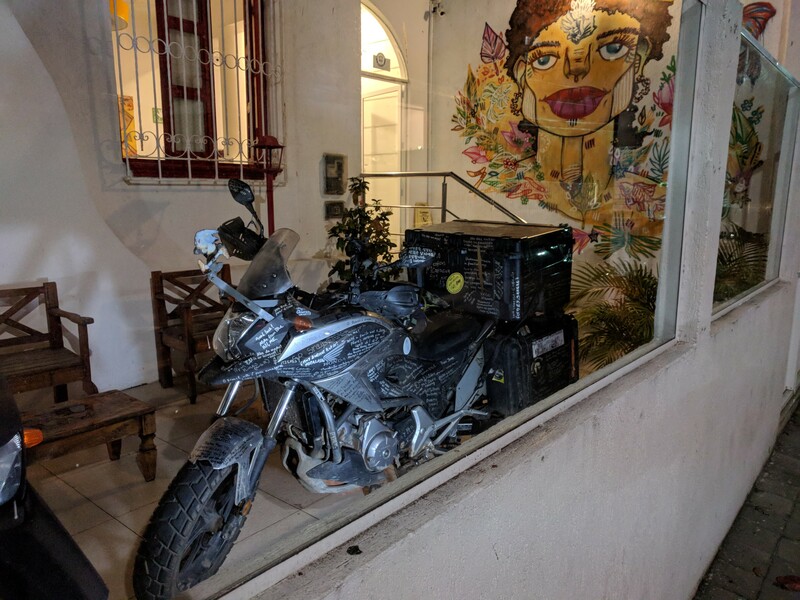 I ignored the signs that said only taxis could enter (or something like that….my Portuguese is pretty shaky, officer) and rolled into the main square. The light looked great and it was almost completely devoid of people. I was a bit worried that a garbage truck was going to ruin my shot though. Once they pulled away, I snatched my opportunity. I got a couple of good options. …but there was a whole truck full of policemen in the area. I asked them about rolling Annie in there, but they were unreceptive. This is the best we could do. I rolled back to the hostel feeling a real sense of accomplishment. It’s really important to me to get a good picture in each of the song places and I feel like I have great representatives for this one. Later in the day, my mood changed drastically. My parents called and told me that the brother of my brother-in-law, Steve, had passed away unexpectedly. He was just 27 years old. I only got to meet him once, at my sister’s wedding, but was really looking forward to getting to know him better. 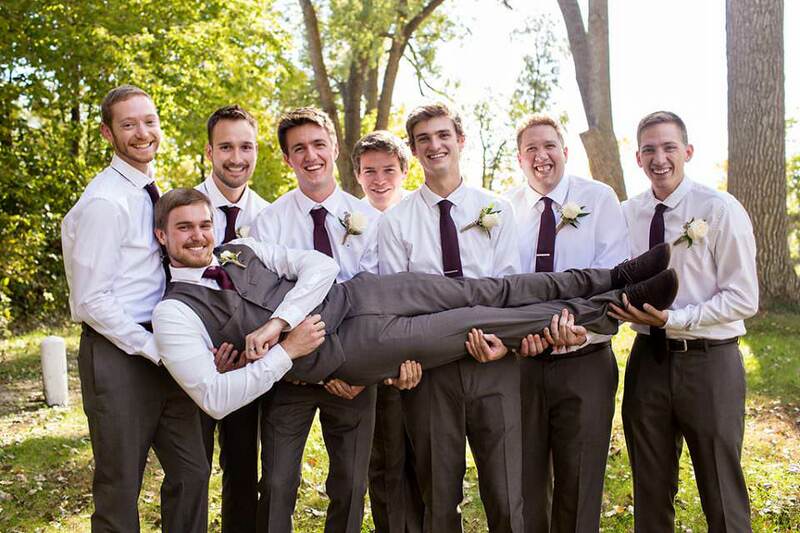 Steve is second to the left in the photo below. I’m going to refrain from going into details, but wanted to mention this for a few reasons. First, to ask for prayers for our family. Second, to help explain my mood in the coming days. The news just really made me ache for those who were closest to him. Part of me just wanted to jump on a plane for home, just so I could give them hugs. 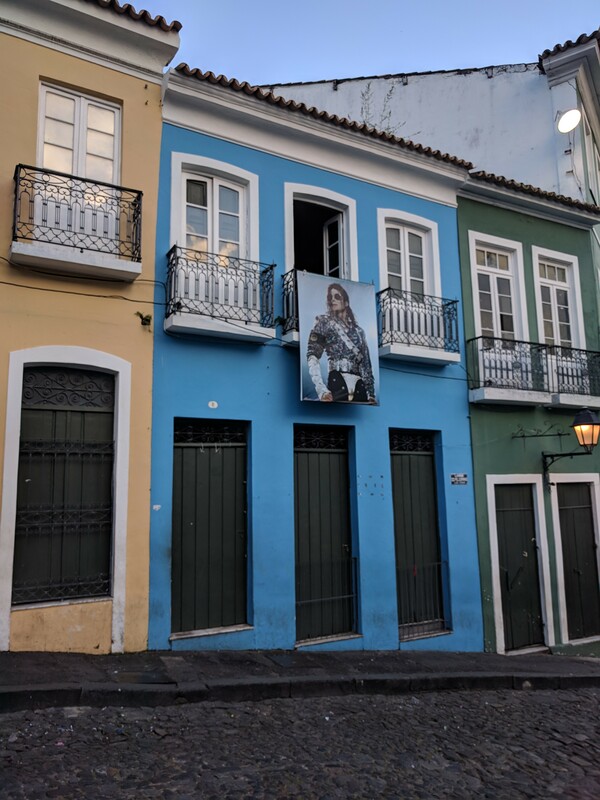 Needless to say, this really affected my enthusiasm during the rest of my stay in Salvador. 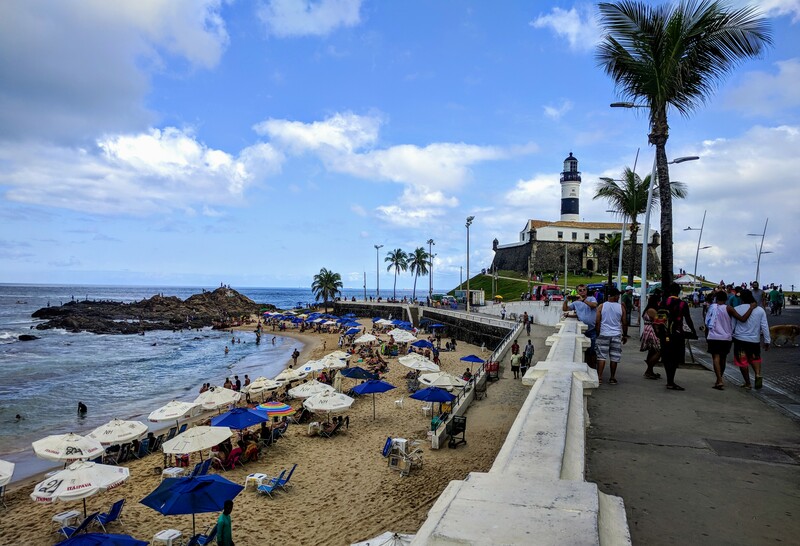 I did a lot of walking around during my time in Salvador. I’m not really sure why, it just seemed like the thing to do. The area along the coast is really serene and a great place to try to collect one’s scattered thoughts. One night I saw a collection of larger bikes and approached the group of guys who appeared to be the owners. I was searching for a few parts and I thought they could help suggest a shop. 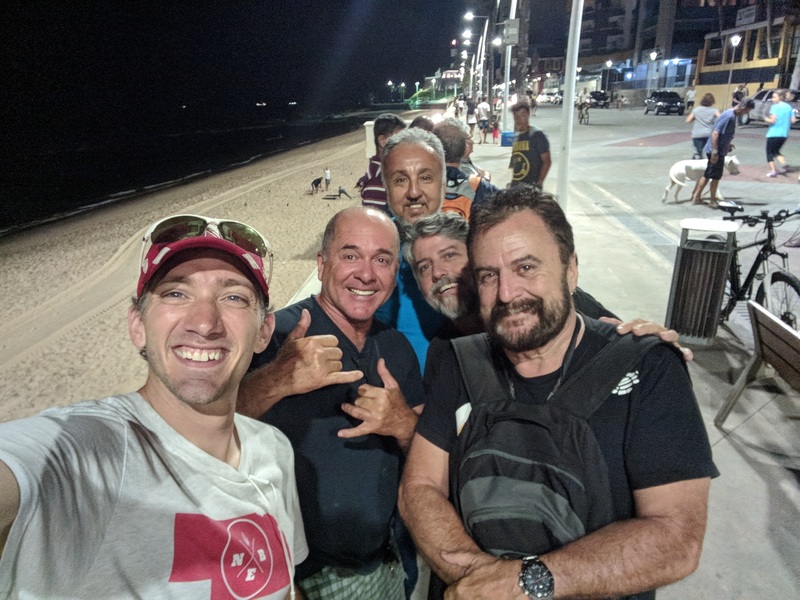 They were typical Brazilians, really helpful and friendly. With their help, I was in a good position to do my part search the next day. I spent a good chunk of the day running around the town looking for parts. My on-call mechanic, Wyoming George, had recommended getting a spare clutch cable before beginning the ride across the interior of the continent. All of the shops I stopped at were really helpful and the third one had my cable in stock. It ended up being about $40. I got to go by the stadium during my hunt. The rest of my day was spent back at the hostel. 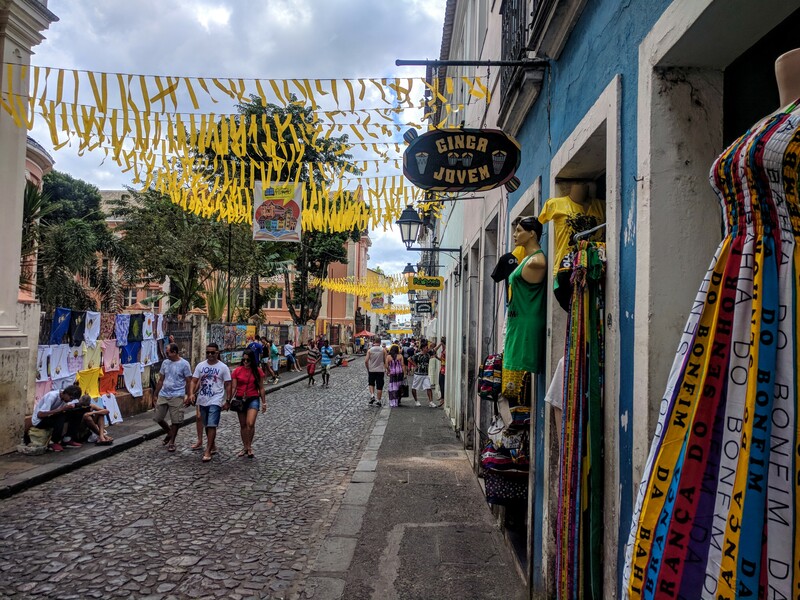 There are so many cultural opportunities to savor, foods to try, experiences to enjoy in Salvador; but I just felt kind of stuck. I didn’t feel like touring, writing, planning or anything else. At the very least, I should have felt like celebrating the fact that I’d now completed all of the hardest locations in my song. But no. I was just *bleh*. 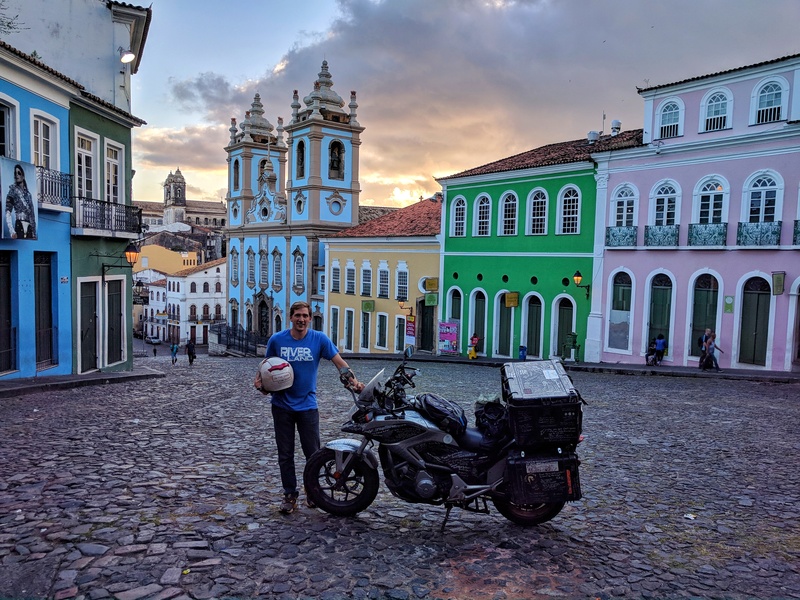 I decided to get back on the road, as it seemed like I wasn’t going to accomplish much more while I was in Salvador. As I had come in on the ferry, I had yet to see the sprawling slums that make up the outskirts of town. 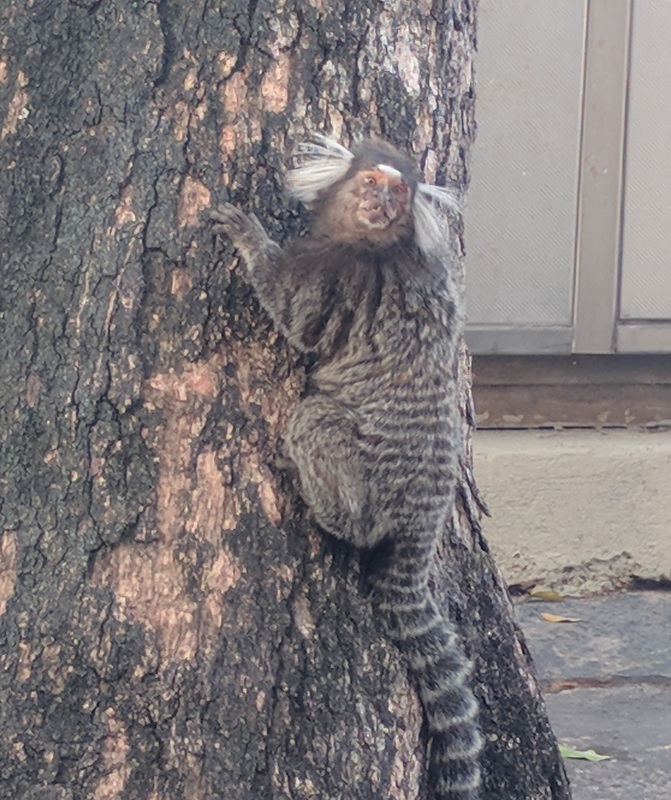 I was amazed at how far they stretched, but wasn’t able to hop off of the bike for a picture. I left town, hoping that the open road might help me regain my focus. Considering the length of time I have been traveling, I have very few regrets about the events that have transpired. 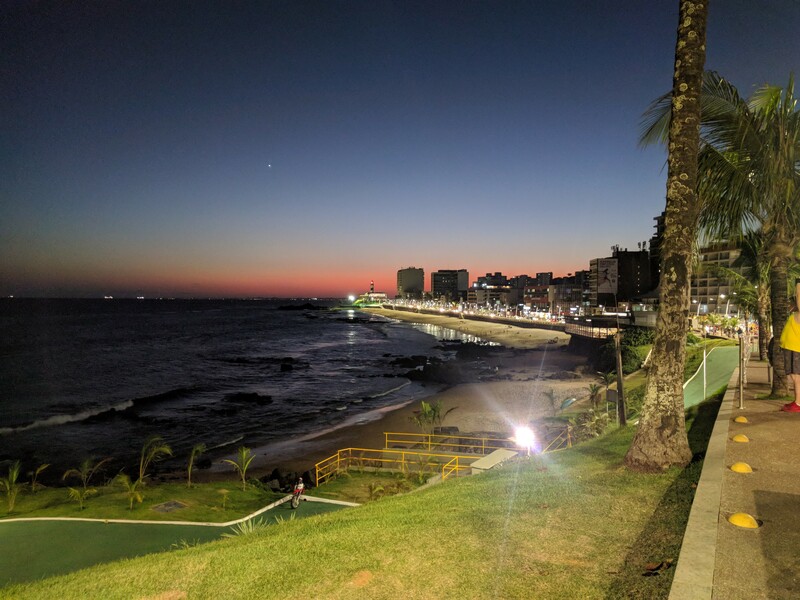 However, I think that when I look back on my time in Salvador, I will be really disappointed with my performance. Despite spending five nights there, I feel like I did a poor job engaging myself with the place and the people. Obviously there were things affecting my state of mind, but usually I am able to push through those obstacles. Still, I know my enthusiasm will return. I have no choice but to be thankful for this unique and exciting chapter of my life. Whatever valleys are part of my journey, I know they are the kind of experiences that will continue shape and change me. Whatever comes next, I know it will be worth it. Realtime update: This was kind of a heavy one, huh? Even though I wrote this weeks ago, I felt all of the emotions again as I was putting the finishing touches on it today. I try to keep this publication light-hearted and enjoyable, but I also want it to be a true representation of the experience. Thanks for sticking with me through all of it. I currently sit in Cusco, Peru, the first place in Latin America I have visited twice. I found a cheap hostel with great internet so I will probably stay here for quite awhile getting caught up. I hope the next week will see me get lots of posts published. I’m currently working on deciding how exactly Annie and I are getting home. I’m really ready to be back on American soil. Shipping from Lima, Peru will get me home sooner, but it appears to be more expensive and possibly more complicated. 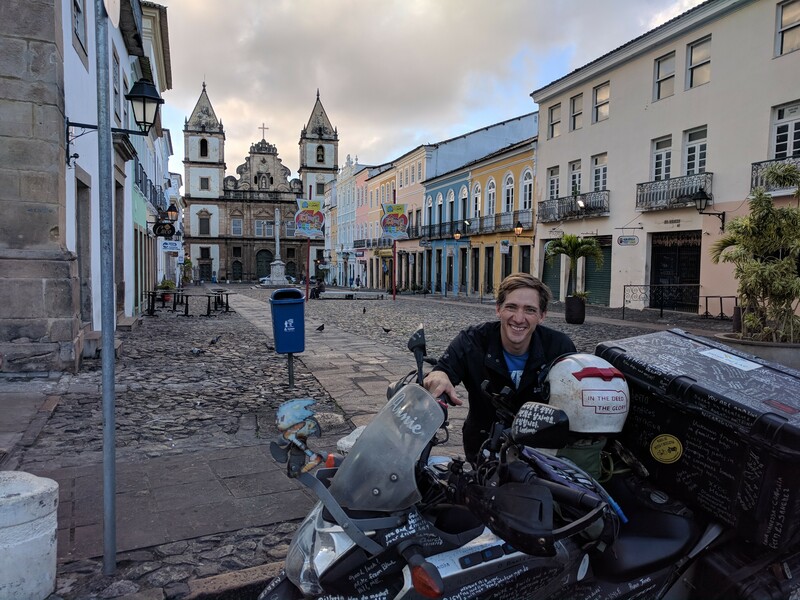 Bogota, Colombia seems like a better option, but it will be about a 2,800 mile ride to get there. I’ve got a lot to decide! Me too! It’s nice to be connected again. Brett, we follow along to share your experience. That doesn’t just mean the good parts. I hope you never decide to give us the “Disney” version of your trip. Share the bad along with the good, that way we can truly feel engaged in your life and not just catching the highlight reel. (My best sports ball analogy) I’m glad you made it through safe and I look forward to the coming updates. Ride safe my friend. We agree with the above two posts! So proud of your honesty and how very much you care for those who are hurting! Traveling has its emotional as well as physical ups and downs. So many people are eager to hear from you again so we’re thankful you have internet and could get this post out! Bring the rest of them on!!! We can’t wait! Great pictures as usual! My fingers are starting to cramp up, but I’ll push through! Love you too. I’m still praying! Everywhere Man, I am so thankful you are back online and still posting. Just know that lots of folks were praying a little more intensely for you while you were “absent”. I felt it! I felt bad that I couldn’t update. It was just sort of bad luck with internet. I’m getting caught up now! It is a brilliant journey and and an even more brilliant portrayal . Thank you so much! It’s a lot of effort, but I think it is well worth it. Glad to have you along! Previous Previous post: North? Nobody Ever Goes North.